The National Endowment for the Humanities invited me to a week-long workshop in New Orleans called New Orleans: Music, Culture, and Civil Rights. For about the last seven years I have had a strong love for New Orleans ever since I realized the amazing music (not just jazz) that hails from this city. In my week, I have learned why so much great music comes from New Orleans, and how this can help me as a teacher and a writer. Dorotha “Dodie” Smith Simmons told our group of about twenty-five, “It’s not New Orleans Jazz, it’s New Orleans music.” This is because a lot of the music from this city cannot be called jazz, and cannot be denied. I knew our workshop was going to focus on all of the great music from New Orleans when we visited Congo Square. Baba Luther Grey had our group dancing and drumming in the hot sun of Congo Square, the gathering spot on Sundays for slaves and free men of color. These gatherings were full of drumming and dancing. The Africans in the square would bring the rhythms and instrumentation from their home regions of Africa. These roots, stirred with the reality of slavery and spiced with the rebellious act of celebration, created the gumbo known as jazz. Dodie said, “It’s participatory music. No spectators.” Baba Luther Grey had everyone taking turns on different drums and playing different rhythms. I knew this week would not be conventional weekend when I heard a rhythm I recognized. I paused. I thought. Then it came to me — Shake Your A$$ by Mystikal. This song has always been a favorite, a goto party song to get everyone dancing. When you get a bunch of teachers playing Mystikal on a Monday morning, you know it’s going to be a good week. That night I went and see world-renowned trumpet player Irvin Mayfield’s new group called Cirque du Freak. When I walked into Kermit’s Mother-in-Law Lounge I didn’t think Mayfield was playing yet, because there as a DJ on stage with turntables. I looked again. It was Mayfield on the turntables. He would be welcomed in any jazz club, but instead he was DJing in a small bar. His DJ set evolved into a odd electronic jazz band that the reminded me of Herbie Hancock and Miles Davis with his Jheri-curl. The music was great. It had a fun, funky groove with passionate and uninhibited solos. Then Kermit Ruffins, bar owner and local legend trumpet player, came to the stage. He sang “Let’s Stay Together,” traded solos with Mayfield, and rapped about how lazy his wait staff is. The music, with the free red beans and rice, made the night one of the best. Tuesday was full of brass bands — my favorite type of New Orleans music. We had a private concert from the LEGENDARY Treme Brass Band. These guys can make a potato dance. New Orleans music isn’t about impressing the audience, it’s about making the audience have a great time. We did! A lot of brass bands have some fringe players that are in and out. We were lucky to have Corey Henry perform at our show. That night I was able to bully about a third of our group to go to the Maple Leaf to see Rebirth Brass Band. Rebirth has been playing the same bar every Tuesday night for 27 years! The band has members that range in age from original members in their 50s and members in their early 20s. The legendary bar was packed and Rebirth killed it while playing under the picture of James Booker’s prone body. Side note: I took this picture of a piano in the back of the bar. I can only imagine this was the piano Booker used during his legendary residency at the Maple Leaf. I had two takeaways from this night: first, New Orleans musicians realize the importance of education. The older musicians are always teaching younger ones, as they were taught when they were younger. And second, sometimes talented musicians still need to drive an Uber to make ends meet. Wednesday we toured The Backstreet Cultural Museum. The parades that are iconic to Mardi Gras today started as a rebellion to the French Mardi Gras celebration. Slaves and free people of color were not allowed to participate in the French Mardi Gras. So they dressed in elaborate Native American costumes, drag, and blackface and held their own parades that started in the Treme neighborhood, right where I-10 lands now. These parades were more fun, and eventually overtook in popularity the parades they were mocking. To say the costumes were elaborate and full of celebration, pride, and story. They were made all year only to be worn for a day. One thing that always made me wonder about Mardi Gras was how the native american influence happened. What I learned was that oftentimes escaped slaves would live with a Native American tribe. Each culture respected and influenced the others. Thursday was easily my favorite. We went to Preservation Hall. I’ve never known what to make of Pres. Hall — a tourist trap recreating the days of ol’ or a necessary snapshot of an important American moment in time. It’s the latter. New Orleans music and musicians have never been big on genres. They subscribe to Duke Ellington’s idea of only two genres of music — good and bad. Because of this music has kept evolving in New Orleans, beyond jazz. Well Preservation Hall is a perfect snapshot of the jazz my grandfather loved. The weaving woodwinds. The subtle, delicate beat. The layered piano. Our group was given a private concert in Preservation Hall. I walked in, saw a seat front and center, and grabbed it. The show was absolutely beautiful. Each song took me away. My favorite was “You Are my Sunshine” — a song my daughter loves to sing and learned as a present for my wife on Mother’s Day. About half of our group were music teachers. We all joined in singing the song. After a few verses, the band dropped out and sat back and enjoyed our choir. I sat near a music teacher named Veronica. When she sang I heard one of my favorite voices ever — Edith Piaf meets Ella Fitzgerald. Seriously. Band members started to smile and point her out to each other. It really was that beautiful. There was an optional outing to Studio Be. I’d heard chatter about how amazing it was, but knew nothing. I didn’t even know what it was. I decided to go on this blind date, and was really moved. I’m usually the type that finds art museums boring. Nine out of ten times they are. B Mike took over an abandoned Treme housing project and turned it into a gallery. He spray painted right on the sheetrock. The project grew in popularity and was shut down. Then B Mike opened Studio Be. It included some of the original sheetrock pieces for the housing project and more new pieces. I really can’t add commentary that will do my experience justice. One idea that was clear throughout B Mike’s art, is the Civil Rights Movement is not over. Friday was bittersweet, our last day. That morning I saw Veronica signing to everyone at the omelet station. I knew she had a song bursting inside of her. That afternoon we had our closing ceremony at a former US Mint. After a performance and Q & A from some AMAZING musicians, including presenter and piano player Dr. Courtney Bryan and Preservation Hall saxophonist Calvin Johnson. Next, co-leader Bruce “Sunpie” Barnes lead a band as we snacked and celebrated. Before Bruce’s performance, I joked with Veronica that I was going to get her to perform one more time. We laughed, but I was serious. As Bruce finished his last song, I shouted, “Hey Bruce, can Veronica sing a song?” He said, sure, but continued to pack up. Veronica walked up, nervous and caught off-guard. Dr. Courtney Bryan joined her and together they gave a memorable performance. There were only a few dry eyes in the house after her song, which beautifully closed the week. Okay, right now I’m in the final stages of sending off my book to Kickstarter backers. They’ve been a patient and supportive group and deserve this ASAP. That being said, I need to break and mention what just happened. I saw a squirrel taking a poop. I really did! No, this is not an ADD incident (well, maybe it is). This is important. I’ll tell you why. For me and many, middle school was horrible. Those were some of the worst years of my life. I’m now thirty-three, almost thirty-four years old. Middle school has been in my rearview mirror for almost twenty years, but I still remember those moments: being dumped over speakerphone from a party, fights started with me in the cafeteria, and being hunted by a school bully because I told the teacher he was smoking in the bathroom. Fun! One day in middle school I was in a particularly reflective and curious moment when I looked out the window. A squirrel was running around. At that moment I felt caged, troubled, and couldn’t see any light. The squirrel was free. No awkwardness, confusion, or struggle. I was jealous. He elaborated to tell me that despite their freedom, squirrels must always have dirty backsides (I’m trying to clean everything up). My friend’s reaction was so quick. I could tell this was something he already thought about. To him, he weighed all of the pros and cons of being the most intelligent species on this planet and the thing that tipped the scales was toilet paper. Humans work ourselves to death, struggle, fight wars, and oppress others, all for toilet paper. I didn’t agree, but couldn’t argue. All these thoughts rushed back into my noggin as I stared through my basement window. 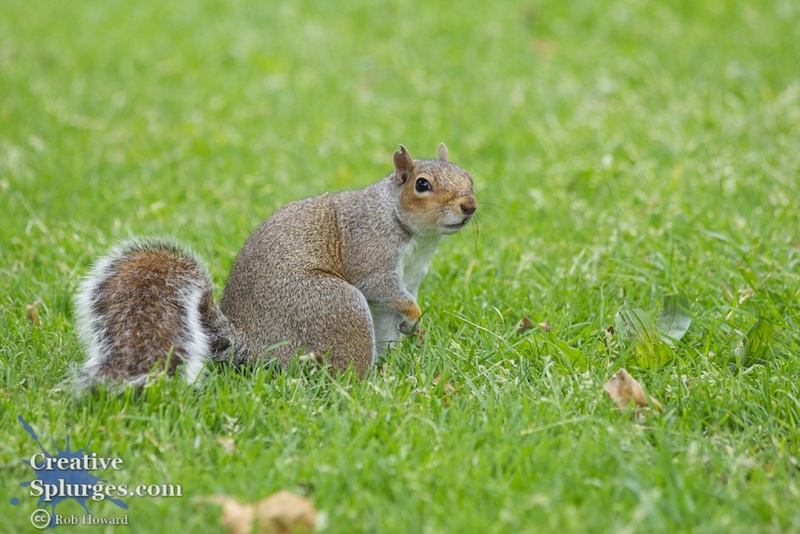 Without going into great detail, the squirrel seemed to quickly and effortlessly take care of business. It also didn’t seem uncomfortable afterwards. No need for toilet paper. Had I known this back in middle school, I might have turned out differently. It’s great that I saw this odd action of a squirrel pooping today. My first book will be released on October 6th. I have a great, loving wife and an amazing daughter. I work at a fantastic school with some very talented people. My friends are inspiring and fun. A squirrel wouldn’t have these things. Lack of toilet paper included, I’m glad I’m not a squirrel. Now, I want to start by saying I am not a drug user. I've seen what drugs can do. Friends have told me about life changing ideas and levels of understanding reached through drug use. I have also unfortunately seen the worst of what they can do to people and families, everything from apathy to death. I hate drugs. Kickstarter is a drug. I love Kickstarter. This love/hate relation with Kickstarter has been my greatest joy (family aside) and largest stressor (family included) in my life. Depending on the day, the word "Kickstarter" makes me swell with pride or hang my head and moan. Is it my fault? Yes. Many drug users blame the drug; I will not. On October 20, 2013 my 30-day Kickstarter campaign ended with just over $16,000 raised for a $5,000 goal. I was ecstatic! Friends and family were telling me how proud they were. At parties everyone had questions and wanted to chat. At this point the book was "done." I had written and revised many times. I joined a writing group and slowly vetted it through biweekly meeting. After about a year with the group my manuscript had been torn apart and sewn back together with a gentle hand. I felt like I was ready. The $5,000 funding goal was set based of bulk pricing from bookbaby.com. In my head, as soon as funding was complete I would send bookbaby.com my Word file and a few short weeks later I'd have a pallet full of books to ship off. Overall I'm glad things didn't end this way, but they would have been a lot easier. After my campaign was funded, but before it ended, I was approached via email by Naren Aryal and Josh Patrick from Mascot Books. Their business is what I've now come to know as "partner publishing." For a fee they would help edit, add illustration, provide guidance, and ultimately publish. The price was fair and I was excited to work with people who had experience and expertise in the publishing field. I also knew this would allow me to give my backers a far superior product than originally intended. When this editing process brought us to the third act of my story, I knew something had to change. My original manuscript had a passive action-less ending where Dewey stood at a neighboring building watching everything (he set up) happen. On May 7, about a month after my daughter was born, I posted an update saying that I would be taking extra time to rewrite the third act. This was my most liked update, but it was probably because of the picture of my daughter. She's a cutie! Unknown to me at the time, but a few days earlier my cousin was arrested in Honduras on false charges of gun smuggling for 5 weapons that were properly permitted and declared. My life was on pause trying to ring every bell to get him free again and it worked. Another day I'll tell this story, but for now I'll post some links in the comments. Between a newborn, a tough year teaching, a Kickstarter campaign, and a family member held captive in one of the most corrupt counties, I was going crazy. By October of 2014 the updated draft was submitted. The time since then has been focused on editing, artwork, and layout. This was a SLOW process that included highlights of seeing my cover artwork and final layouts, but was also full of long periods of waiting on updates from Mascot Books. Similarly, my backers were waiting for updates. I try and always look at issues through as many different lenses as possible. Everyone at Mascot Books has been pleasant, excited, skilled, and very helpful. I think the main reason that these edits took so long was because I took so long. This was a year after my Kickstarter was funded and I started working with Mascot Books. I learned a valuable lesson. In business, but also in life, exhibit what you need others to exhibit. Don't expect kindness if you're mean, punctuality if you're late, or attentiveness if a full year has past. I know this, now. Just because the book is at the printer, it doesn't mean my campaign is done, far from it. I'm still on the clock and there is still a lot of work to be completed. I wanted to write this as my first blog post so others can have a more full idea of what my Kickstarter journey has been. There have been highs and lows, just like any drug. In the butchered words of Hunter S. Thompson, "I hate to advocate drugs, but they've always worked for me." Hello, I'm Michael Carroll, a third grade teacher with a passion for science and storytelling.